Emerging from the office of a late September evening into an atmosphere thick with dark and wet in equal measure, tends to promote a strong desire to rush home, into one’s woolliest pyjamas, and curl up in front of the television. Traipsing through puddles, sliding along station floors, and squinting through a too-bright tube ride in the opposite direction to one’s pj’s, however, is a course of action best avoided. Unless, of course, at the end of that unhappy journey awaits the multi-layered drama/comedy/political/humanitarian production that is The Last Pilgrim. The Last Pilgrim runs in the back-door theatre of the White Bear pub in Kennington. The dark space seats approximately 60 – 70 people along two black walls. The stage is at ground level. The props are sparse, only a chair and a drinks cabinet. The sound is minimal. The lighting subtly beckons the audience to shift perspective in line with the strongest of the soft illumination. The play is set in the backroom of the Ambassador’s Hotel during the run up to the 1968 US presidential race. It is a crucial moment in American history. The Vietnam War is raging; the Black civil rights movement is mourning the assassination of Dr. Martin Luther King; the country is still reeling from the JFK assassination, and Senator Nixon is making a desperate bid for power. The young American revolutionaries of the late 50’s and early 60’s have become older, wearier and disillusioned. The confusion of the nation at that time is embodied by three very different reporters from three very different publications; The Village Voice (James Gordon – a black activist), The Washington Post (Nancy Buckman – an anti-war liberal) and The New York Times (Tom Quinn – a cynic, bitter with the belief that he had been misled by fake politicians during his earlier years). The common thread between these reporters is the various disappointments life has dished out to them. And of course, the reason they came to be in the same room for the first time in close to a decade: a young Senator named Robert Kennedy. The dialogue is sharp, witty and provides some deep insights to the confused mindset of Americans in that young country’s history. 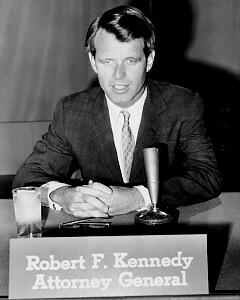 The interplay between the reporters is interspersed with powerful speeches from Robert Kennedy, played by Sean Patterson, who addresses the audience sometimes, and the actors at others. Tensions rise as Bobby Kennedy joins his three guests, who also happen to be his three biggest critics. All four are connected with each other in some way, and all four have suffered in their lives. The interchanges that had so recently provoked belly-laughs from the audience are suddenly to causing them to become welled up with tears. Emotions are raw, and fluctuate easily between humour and horror. Cynical exteriors crumble, secrets of the past are revealed. And yet more tragedy looms. The experience of the cast is evident throughout the production. The performances are immaculate. This production punches way above its weight in a world flooded with movies, books, theatre recording 1960’s America and Vietnam. The themes of the play, the themes of over 40 years ago, are disappointingly relevant to the present day wars in Iraq and Afghanistan, and ongoing battles against racial discrimination. Everyone should see this production while they have the chance; whatever the weather. Writer: Roy Smiles. Director: Tim Stark. Designer – Alexanda Beeden. Lighting – Geraint Pughe. Sound Designer – Mark Dunne. Stage Manager – Sophie Rubenstein. Produced by: Pilgrim Productions. Production Manager – Gary Beestone. Production Photography – Robert Workman. Rehearsal Photography – Rhys Humphreys. PR – Sheridan Humphreys. Costume Assistant – Alice Fitzgerald. (c) Leanne O’Loughlin. 29 September 2009.